Net neutrality is based on a very simple idea: Internet service providers, or the companies that we pay to connect us to the web, should not act as gatekeepers by favoring some websites and companies over others. T-Mobile’s Binge On service—which offers unlimited video streaming from more than thirty-eight video providers including Netflix, Hulu, Amazon, and HBO—violates that key principle according to a new study published by Stanford University researchers. The report argues that T-Mobile’s Binge On “allows some providers to easily join and creates lasting barriers for others, especially small players, non-commercial providers, and start-ups.” It claims that the program hurts competition, limits a user’s choice, and may have a lasting effect on the services people choose based on how quickly they can connect to them. 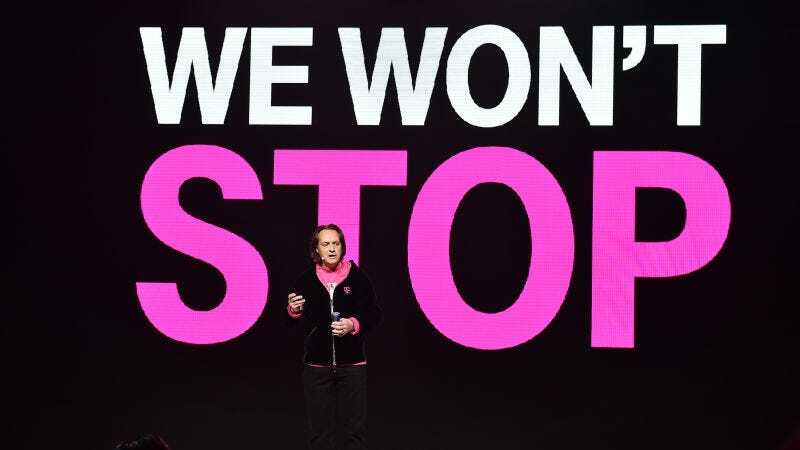 T-Mobile’s eccentric CEO John Legere has, of course, denied the allegations. He’s said that Binge On is open to all legal video streaming providers. It comes to no cost at video streaming companies, so long as they’re able to meet a few basic technical requirements. The problem with that, according to the Stanford Univerisity study, is that T-Mobile excludes providers that use common standards like the User Datagram Protocol, which is currently in use by companies like YouTube. The Stanford report also charges that T-Mobile discriminates against services that use encryption, something that is quickly becoming a standard in the industry. For now, T-Mobile’s Binge On service appears to be doing just fine. The company just added Amazon Video and Univision to a growing stable of video providers earlier this week. The company also released a study that found users are streaming twice as much online video as they were before Binge On. The dispute will likely be settled by the FCC, which created the Open Internet order in early 2015 in order to protect net neutrality. Although it’s still unclear whether or not T-Mobile’s Binge On program is actually breaking the rules introduced by the FCC, there’s a strong chance that the looming allegations will lead the FCC to evaluate the legality of the program. For now, we’ll all have to settle for Stanford researcher’s analysis: That T-Mobile’s Binge On program “violates key net neutrality principles” and is likely illegal.